Aruba is a little Caribbean gem with friendly residents, beautiful beaches and awesome sunsets. Located near the northern coast of Venezuela, Aruba is in the West Indies island chain. Aruba is very small, only 19 miles long and five miles wide. The 2000 population was less than 70,000 people. 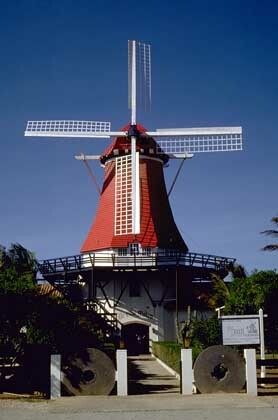 Europeans discovered Aruba in the 15th century and found the island inhabited by the native Arawak peoples. Native peoples have lived on Aruba for centuries. Ancient artifacts discovered on Aruba have been dated as early as 1,000 A.D. After discovery and occupation by the Spanish, the Dutch eventually made Aruba a colony and it wasn't until 1986 that the small island governed on its own. Today, tourism plays a major role in Aruba's economy. Aruba has plenty of sites to see, primarily outdoor and natural attractions, but there are also old gold mines and religious monuments. Terrific scenery and beaches are located near the California Lighthouse. The famous wreck of the ship California occurred on Aruban reefs, lending its name to the lighthouse. Rocky shorelines and coastal dunes combined with the old lighthouse create a romantic setting for visiting couples. Natural Bridge is a natural rock bridge resting 25 feet above the crashing waves. Thousands of post cards and tourist pictures have been snapped at the rock formation. Carved by thousands of years of punishing wave action, Natural Bridge serves as a natural barrier for swimmers and the open ocean. Lourdes Grotto is a Roman Catholic shrine built into the Aruban rock by a priest in 1958. A stature of the Holy Virgin and an Aruban woman named Bernadette are in the grotto. Local legend says that Bernadette saw the Holy Virgin on Aruba. On February 11 a mass is given at Lourdes Grotto after a procession from a nearby church. Aruba actually has gold mines that were very profitable during the 19th century. Gold was discovered at the Bushiribana mine in 1824 and produced more than three million pounds of the precious metal. Balashi gold mine was once a favorite hangout for marauding pirates and is now home to one of the world's largest desalinization plants. Visitors can tour the ruins of the old mine and enjoy the wildlife and scenery. 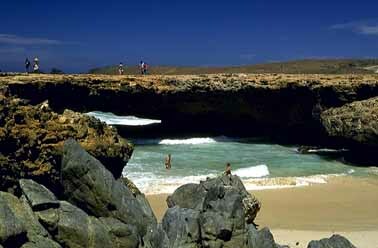 Just as interesting are the caves that dot the southeastern coastline of Aruba. Fontein Cave is the only one with wall drawings created by native Arawak peoples thousands of years ago. Huliba Cave has an entrance shaped like a heart and Guadirikiri Cave has a tunnel that stretches for a 100 feet. Local legends say pirates buried their treasure and gold in these caves. Find out for yourself! 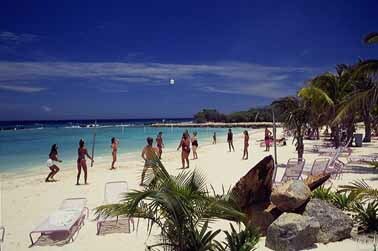 Aruba is a great place to relax in the sun and swim in warm tropical waters. Eagle Beach is a public beach with amenities whereas Palm Beach features very calm waters for wading or family swimming. Baby Beach has even calmer waters and large coral formations for scuba divers and snorklers. For more adventurous swimming, take a trip to Rodgers Beach or go snorkeling at Hadikurari Beach.